Astrid Jones is a 17-year old senior high school student in a small town. Her family consists of a controlling mother, a perfect , athletic younger sister who is the mother’s obvious favourite and a father who drowns his own feelings of inadequacy in copious marijuana use. As nobody seems to want or need her, she spends a lot of time lying on the picnic table in the backyard, watching the planes overhead and sending them her love. As she lies there, she struggles with questions of her own sexuality and her place in the world. I loved King’s Please ignore Vera Dietz and really liked this new addition as well. King likes to add a dash of magic realism in her books (the Pagoda in Vera Dietz, comes to mind); I find it works. In Ask the Passengers, Astrid conjures an image of Socrates as a foil to her emotional chaos and her struggle to understand herself and others. It also made me question my own perception about attitudes towards homosexuality. A good friend of mine already wrote a review of this book and made some very good critical points, one being that the book seems set in the 1990s, the attitudes seem so backward. She mentions also that even the terminology seems outdated- whereas before it was pretty much gay or lesbian, we now most often use the term LGBTQ community. This always makes me wonder about how sheltered I am. I live in a pretty big town, liberal, definitely alternative bubble, where people can just be people no matter what gender they identify with. It is unfathomable to me the kinds of attitudes portrayed by King, the overt, ignorant racism (one character even proclaims that Astrid’s sister “caught the gay”). Then I remember Russia. And Uganda. The fear about gay marriage. The huge debate about this in the States and even in our own country. I remember the grade five student calling my daughter a lesbian as if it was a bad thing. And I remember that my bubble might be liberal and safe, but it is also very small. Astrid’s struggle is not just about her own sexuality, it is about her unwillingness to be defined by other people’s narrow categories. She defies not only her parents , the town and her peers definition of what she should be, but even her gay friends. In the end, the readers feels Astrid’s desperation to love and be loved, her need to be left alone and figure out for herself the answers to her questions. 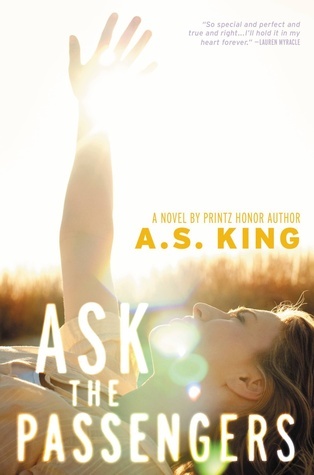 This entry was posted in Books, Books, YA fiction and tagged A.S King, Ask the Passengers. Bookmark the permalink.